Have you heard of Purium 10-day Transformation Cleanse? I dropped 7.5 lbs in 10 days! I got off of sugar and caffeine and my hot flashes stopped soon into my 20 day CONTINUATION. The program is basically a special AMINO ACID formula, that builds/protects muscle taken three times a day between easy to prepare SHAKES. You still get food, but the food plan is super simple. You get to eat every TWO hours! It was so nice to take a break from all the thinking, planning and prepping that goes into eating well. The shakes are LIVE, vegan, non-GMO (rare! ), ORGANIC superfood based. The cost $2.50 per serving and are suitable for meal replacement as well, not just for cleanse, but for people on the go who aren’t eating, eating junk, using mediocre shakes or just want to up their nutrition. I’ll be rolling out a more comprehensive weight loss program soon including blood testing for thyroid, saliva testing for adrenals, stool testing for pathogens, food allergy testing (all contributing factors to why YOU can’t lose weight) as well as acupuncture and Chinese herbs to balance your underlying constitution and BIA (bioimpedence analysis) to track your progress. Here are my before and after pictures. My story as I posted on Facebook is below. If you would like to see more pictures, use #debstransformation from my Facebook page to see the whole thing. Aug 25… I’m so excited. I just ordered my “10 Day Transformation”. As many of you know, this has been a hugely transformational year for me already. My 8 year relationship ended. I lost 30 pounds and I went to China to work on my doctorate. While I was in China I couldn’t avoid sugar and grains. Every day since I’ve been back, I wake up and say THIS is the day I stop eating sugar. I do well until the afternoon and then I lose my resolve. I haven’t gained back any of the weight I lost this winter but I feel more flabby, my brain is a little foggy and I have a feeling these incessant hot flashes may be related to sugar and caffeine. I have been watching my newsfeed start to blow up with women I know doing this program. The results are stunning. I’ve been feeling like a need to do a “cleanse”, something structured to help me break my habits. Day1…I’m so excited to start this cleanse. I have been struggling with sugar cravings for 3 months now. I lost 30 pounds earlier in the year with diet alone. I cut out all sugars, grains and dairy. But my trip to China threw me for a loop. While I have not gained any of the weight back, my body feels terrible. My belly is bloated and I feel very squishy. My feet hurt when I step out of bed in the morning. My neck pain is chronic and my hair has started to fall out again. So… I’m heading to LabCorp to run some blood tests. Before I lost the weight my TSH and cholesterol were high. They came back down to normal after 2 months sugar free. I figured now was a good time to check again. I’m a geek. Day 3… Bloating is way down and I lost 4 pounds. Of course I did, my body does not like grains. I lost 10 pounds in one week when I stopped eating wheat 20 years ago. It is water. But what does that mean? I look at intracellar and extracellular water. We want water IN our cells. That is hydration. When we are toxic with foods we shouldn’t be eating or suboptimal liver function (think methylation and more, not just liver enzymes on a blood test) our cells release precious water to protect themselves. Remember: The solution to pollution is dilution. Eliminate the toxins and you will let go of that water. The water you need in your cells will return. If you are on a weight loss program and NOT losing weight this could be why. Either continued exposures to toxins or sub optimal liver detoxification. Day 4…Well, its official, I am now presenting with Hashimoto’s thyroiditits. Avoiding gluten has kept my antibodies low all of these years, but sure enough after my exposure to gluten on my trip to China my TPO is up to 55. It has never been over 9. And that exposure was MINUTE. I ran my numbers before I started this cleanse to see what kind of effect it would have. And the three months of indulging in sugar has definitely affected my HbA1c (borderline high) and blood sugar (super low). My TSH is back up, although not as high as before I got off the sugar this winter. I’m so glad I decided to take the plunge and do this cleanse. My goal was to get off of sugar and reset my metabolism. These numbers are scary and will be a huge motivation for me to continue a healthy anti inflammatory lifestyle. Day 7… For the first time in 7 years I’m below 150 lbs. WOOT! I know you are supposed to love your body no matter what its size or shape, but it was rough when I was 35 lbs heavier. I LOVE how my body feels right now. The‪#‎aminos are rocking my world. When I lost my 1st 30 pounds I felt like a bag of skin. Now my skin AND muscles are firming up, with relatively no working out. I feel 5 years younger than I did a week ago. Day 10…The results are in! I lost 7.5 pounds during my 10 day transformation. I got off of caffeine and sugar and my energy is through the roof. I’m starting to sleep better and my hot flashes are definitely less intense and less frequent. I hit a plateau on day 7 but even though I only lost one pound in the last 3 days I did lose fat and gain muscle. I have a bio impedance analysis machine at my office so I can measure these things. My extracellular water is still higher then my intracellular water so that explains the slower weight loss. I need to support my detox pathways more. I did my first colon hydrotherapy session in 25 years yesterday and will up the dry skin brushing. I love these products, this system this community. I got great support and see this as a tool for me to support other people from afar that I could not work with in person. 10 Day Transformation completed!! Today I started the 20 day “Continuation”. Dinner tonight was my first post cleanse meal. Salmon has never tasted so good. I think my new favorite comfort food is zucchini with lemon, salt and olive oil. SO satisfying. Before and after pix are being processed. Stay tuned…. Day 11… I really can’t believe how much energy I have with NO caffeine and NO sugar. Day 17…This is what I’m talking about! In the past week, the first 7 days of my continuation I “only” lost ONE pound. 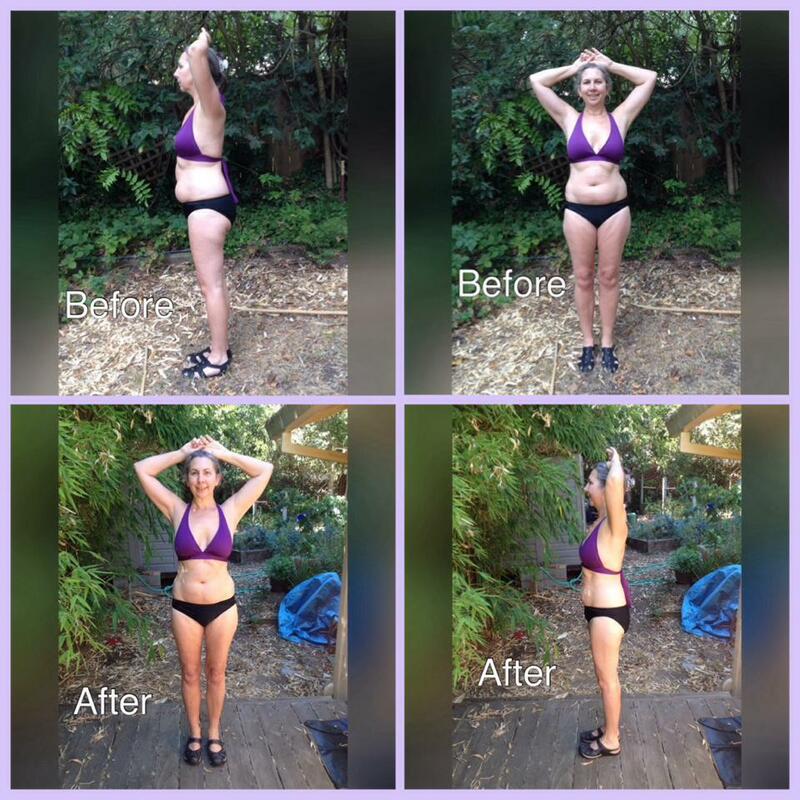 But look closely… I GAINED 3.9 pounds of lean tissue and LOST 4.9 pounds of FAT!! And I have spent the last 3 days driving in my car and sitting in a seminar. My metabolism rate is up from 1454 to 1510, That means I’ll be burning even MORE fat while I SLEEP!! Now its time to get my intracellular water up. Day 20… I’m blown away… I’m 10 days into my 20 day continuation and in the last 5 days my hot flashes have suddenly abated by at least 50%. I don’t know if its the extra fat I’m eating (thanks to Bina Jangda for that suggestion) or the upleveling of my nutrition with the amazing products I’m taking, or if my blood sugar is stabilizing as a result of the 10 day cleanse or that I finally got off caffeine and sugar. Maybe a combo of all four, maybe something else. Whatever the reason… I’m grateful!! Day 30… Down 11.5 pounds since I started the cleanse. That makes a total of 38 pounds since I grabbed the bull by the horns in Feb. I’m off of sugar and caffeine. My energy is even, my hair has stopped falling out and my hot flashes are GONE.